The origami crane is perhaps one of the best-known origami models of all time. The crane symbolizes peace and hope. Folding 1,000 paper cranes is said to grant the folder the right to make one special wish. The traditional origami crane is folded from a square sheet of paper that is made into the bird base form. Over the years, however, creative paper folders have adapted the basic crane instructions to create many unique variations of the project. They've turned cranes into envelopes, place card holders, boxes, and more. Wavy Wing Origami Crane: Useful Origami has a tutorial demonstrating how to make a crane with wavy wings. This slight variation on the traditional folding process produces a model with an entirely different look. Origami Heart Crane: Origami Club has instructions for a heart with an origami crane inside it. This flat design would be excellent for decorating homemade Valentine's Day cards. Origami Crane Box: The Girly Side of Travel has an interesting tutorial for an origami crane gift box. The box portion is nestled in the crane's body. It can be filled with mints, nuts, or wrapped candies for a party. You could also use it on your desk to store paper clips, rubber bands, or other small office supplies. Modular Origami Crane Wreath: OrigaMila has instructions for a modular origami crane wreath that would be a pretty decoration for any room in your home. The text is not written in English, but the photos are clear enough that any folder familiar with how to make a traditional origami crane should be able to follow along. Origami Crane Bookmark: All About Origami has instructions for a bookmark that has an origami crane on the top. The bookmark is a long thin rectangle. A few cuts are needed to complete the project, but it's a clever take on the traditional crane design. 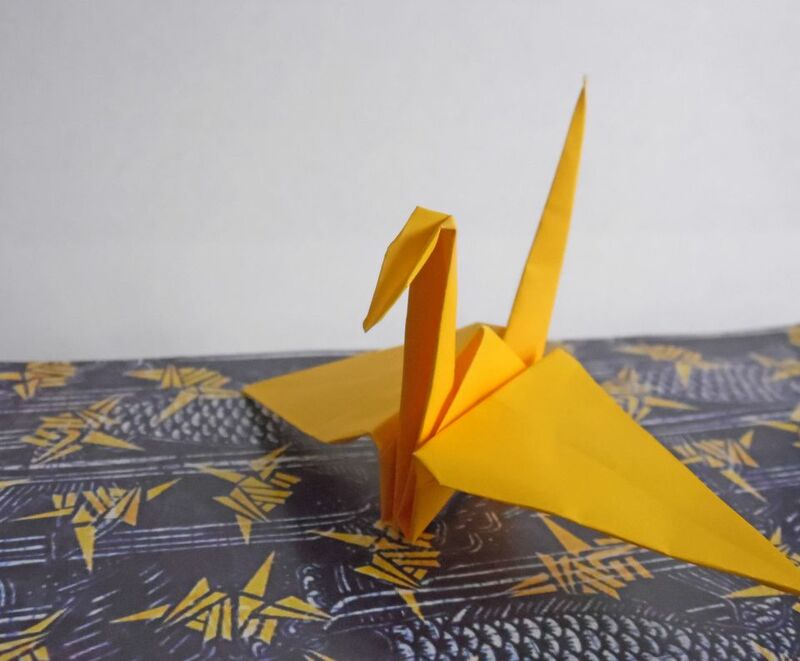 Make a special gift for a friend by writing a message on the base of the crane bookmark and sticking it inside a copy of his or her favorite book. Origami Crane Place Card Holder: Artis Bellus has instructions for an origami place card holder that would be pretty as a decoration for a wedding table. Use embossed papers to give the place card holders an elegant look. Origami Bracelet Charms: If you have the patience to fold very tiny origami cranes, Cut Out and Keep suggests turning them into charms for an origami bracelet. The same technique could be used to make earrings and a necklace if desired. Origami Crane Croutons: Evil Mad Scientist uses the traditional origami crane folding technique, but folds with wonton wrappers to make origami crane croutons for your salad. This would be a fabulous addition to any origami themed party. Electronic Flapping Origami Crane: High-Low Tech shows how you can turn your origami crane into an electronic toy that flaps its wings when you squeeze its tail. This could be an interesting science fair project for the young paper folding enthusiast.